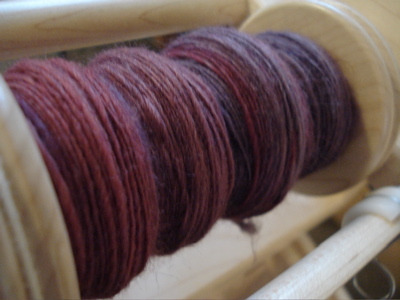 This is the superfine merino, which is full of subtle color changes. 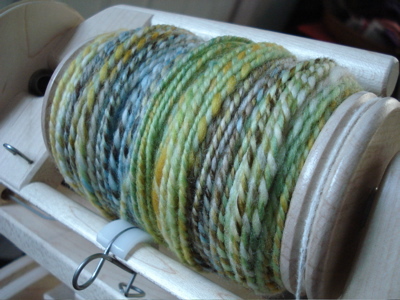 I wrestled with this fiber a lot in sections, and I wonder if I should’ve tried to open it up a bit before spinning. 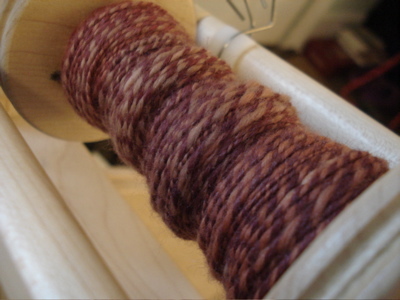 Despite what it looks like (you know, that I spent the WHOLE day spinning), I actually wrote a few more pages yesterday, and did some good thinking about my project whilst spinning. I did not, however, begin tackling the pile of grading. (Yesterday, my headache was the excuse.) Today, I need to get on that. 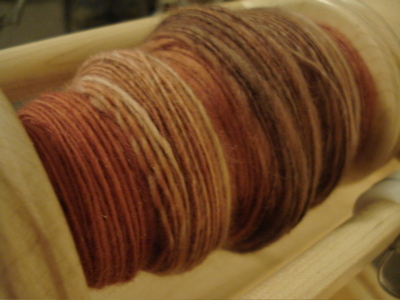 This entry was posted in spinning and tagged 2-ply, AVFKW, baktus, beach day, boh, FLUFF, FO, merino, merino/silk, plying, spinning, squish, sw merino, worsted by barefootrooster. Bookmark the permalink. 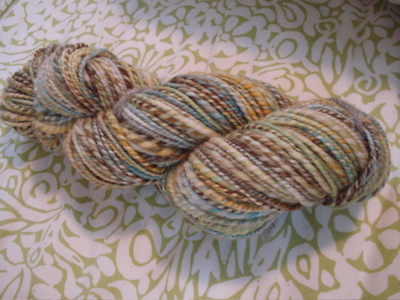 That is one gorgeous skein of yarn. And also, I’ve had one of those headaches for three days now. I think for me it’s just stress, combined with staring at a computer screen all darn day. I hope you feel better this morning! Beautiful. Completely and absolutely. 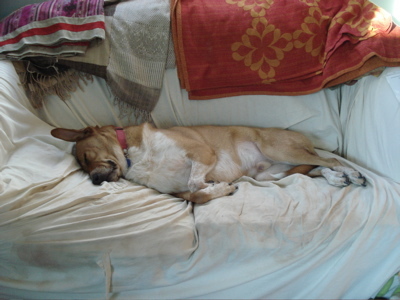 That dog makes me lose all motivation to do anything but curl up on the couch. I love the shot of the bucket ‘o fiber! Beautiful! Hope the headache has lifted. I get those too- not fun. 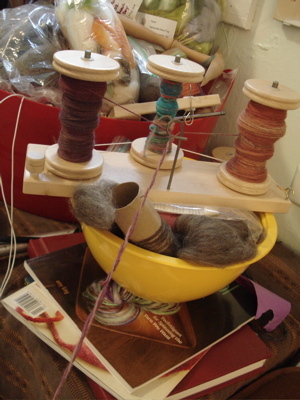 How do you like your book Spin Control by Amy King? I hope you feel better soon. Or maybe you need to take Boh’s lead and go down for a nice snooze. Obviously he is not concerned today. 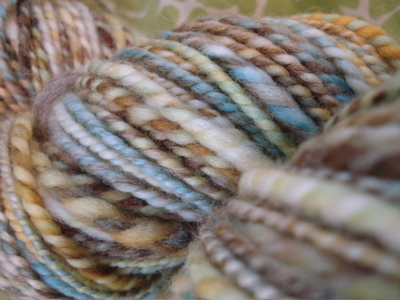 Simply stunning yarn. Yea, too sophisticated for a kid knit. G o r g e o u s yarn! Nice! That sounds like quite the day. Lacy Baktus is such a neat pattern — can’t wait to see it knit up in your handspun! 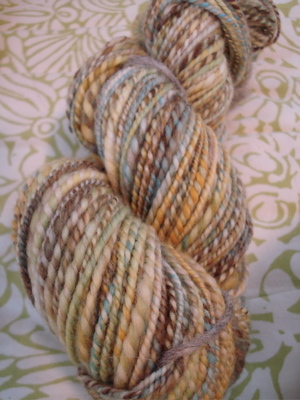 I’m thinking about using some precious Madelinetosh sock yarn I picked up in Portland for one.